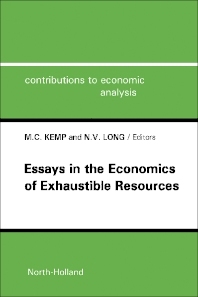 Contributions to Economic Analysis, 150: Essays in the Economics of Exhaustible Resources focuses on the processes, principles, methodologies, and approaches involved in the economics of exhaustible resources. The selection first elaborates on the problem of survival, towards a more general theory of the order of exploitation of non-renewable resource-deposits, and the optimal order of exploitation of deposits of a renewable resource. Discussions focus on optimal trajectory, stable locus, assumptions and formulation, set-up costs and flow fixed costs, possibility of storage, costly extraction of deposits, and technical progress. The text then examines the transition from an exhaustible resource-stock to an inexhaustible substitute and the development of a substitute for an exhaustible natural resource, including dispersed ownership of the resource, social optimum, and single monopoly of the resource and its substitute. The manuscript takes a look at optimal taxation and economic depreciation, efficiency of competitive markets in a context of exhaustible resources, and oligopolistic extraction of a common-property resource. Topics include rational-expectations equilibrium, implausibility of the assumption of competition, second-best taxation and the undesirability of the economic depreciation rule, and the effect of other taxes. The selection is a valuable reference for researchers interested in the economics of exhaustible resources.